NASA's Juno spacecraft has bounced back from the glitch that prevented it from gathering any data during its flyby of Jupiter last week, agency officials said. "Juno exited safe mode as expected, is healthy and is responding to all our commands," Juno project manager Rick Nybakken, from NASA's Jet Propulsion Laboratory in Pasadena, California, said in a statement Tuesday (Oct. 25). "We anticipate we will be turning on the instruments in early November to get ready for our December flyby." 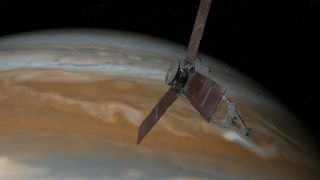 Juno went into safe mode when a software-performance monitor caused the spacecraft's computer to reboot. The mission team is still investigating exactly why this happened, NASA officials said. That's not the only hiccup Juno has experienced. The probe was supposed to perform a lengthy engine burn during the Oct. 19 flyby, to shift from its current 53-day orbit into a 14-day path around Jupiter — the mission's final science orbit. But an issue with a set of valves in Juno's main propulsion system forced this burn to be delayed; the earliest it can now occur is Dec. 11, during the next flyby. To help get ready for that encounter, Juno performed an "orbital trim maneuver" Tuesday, firing its smaller thrusters for 31 minutes to change its velocity by about 5.8 mph (9.3 km/h), NASA officials said. The $1.1 billion Juno mission launched in August 2011. The solar-powered spacecraft is using its nine science instruments to study Jupiter's structure, composition and gravitational and magnetic fields, to help researchers better understand the giant planet's formation and evolution. Juno gathers the vast majority of its data during its close Jupiter flybys. "We are all excited and eagerly anticipating this next pass close to Jupiter," Juno principal investigator Scott Bolton, of the Southwest Research Institute in San Antonio, said in the same statement. "The science collected so far has been truly amazing." The mission is currently scheduled to continue through February 2018.